A few days ago, I welcomed an opportunity to be part of a feature in television (TV) that would showcase how some Filipinos pay tribute to world-renowned Filipino boxer, Manny Pacquaio. I was to share my Pacquaio inspired nail design. I've started nail painting last year and since then have fell in love with this hobby. I used this to show my appreciation for the pound-for-pound boxer. 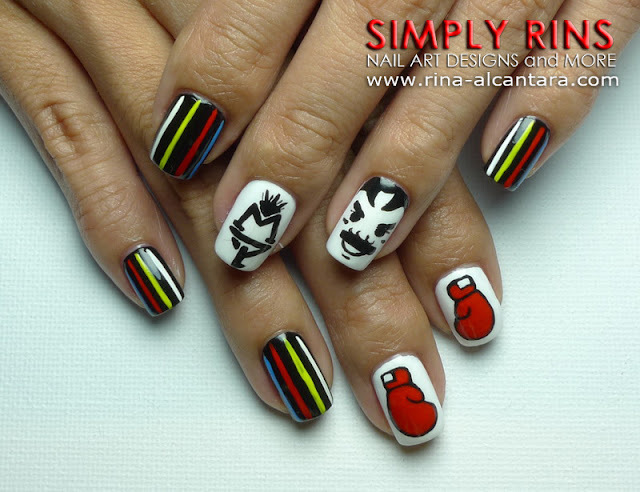 The TV network asked if I could recreate or create a different Pacquaio nail art as compared to the previous one I did last year. More photos of the nail art can be viewed here. The segment was aired in Good News With Vicky Morales on GMA News TV, Channel 11 at 8:00pm on Sunday, November 20, 2011. The feature was in Filipino so in behalf of my international friends, I added an English subtitle on the video footage that I recorded earlier this evening. I liked how the feature turned out because it showed a little of how I paint my nails and the materials that I used. For those who asked me regarding the matter, I hope this short feature can help. I am humbled by the blessings that my nail art blog have been receiving. I am thankful for all the recognition and opportunities that came and will still come (hopefully). But most of all, thank you to all supporters and friends of Simply Rins, for making all these possible. Wow!! this is awesome!! keep up the good work!! Luv it! this is really cool!! congratulations!!! Thank you all very much ... really! Where did you get your detailing brush. the one that you use in this video?